With less than 2 million inhabitants, built on the banks of the Danube, Vienna is perhaps the most prestigious capital of the world. In Vienna life is slower than in most European capitals and this is one of the reasons that is among the cities with the highest living standards in the world. I can think of dozens of reasons to visit Vienna. It is one of the most beautiful city in Europe, with a huge history, famous for its architecture and palaces, the birthplace of classical music. But it is also a modern, clean, vibrant and calm, creative city. Spring and Autumn are the best times to visit Vienna because temperatures are ideal and the sun makes the city even more beautiful. However, for those who are willing to defy the cold and snow, during Christmas, with glowing lights, Christmas markets and grilled chestnuts in every corner of the street, the city is more beautiful than ever. The month of August is not ideal, as the temperature rises and most of the shops are closed for holidays. Innere stadt: Even if you visiting Vienna for half a day and have no time to visit any sights, you have to take a stroll to the historic city center. St. Stephen's Cathedral: The Cathedral of St. Stephen was built in 1160 on the ruins of two previous churches. 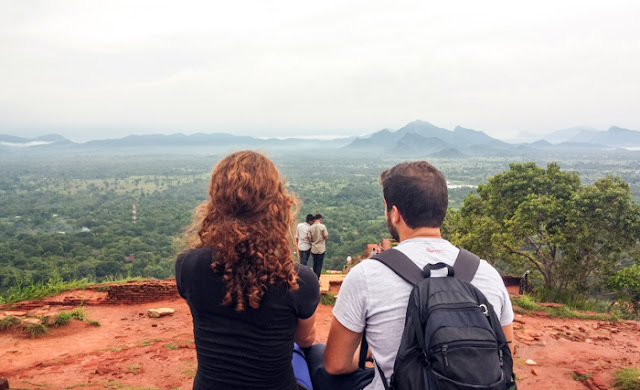 Its huge southern tower, built between 1368 and 1433, reaches 136.7 meters high. One of the most recognizable symbols of the city is its impressively colored roof, consisting of 230,000 colorful tiles. Schonbrunn Palace: One of the most famous landmarks in the country. In the past it was the royal family's summer residence. The inside of the palace is very impressive, but better to go early to avoid the huge queues. Schonbrunner Gardens: The gardens are the perfect place for photos and include a labyrinth, the Tiergarten, the world's oldest active zoo and a botanical garden with 32 statues. MuseumsQuartier: The Square of the Museums of Vienna is a collection of museums and galleries, where the imperial stables used to be. These are some of the original buildings with some impressive modern additions. In addition to the museums in the area, there are several shops, cafes and bars. 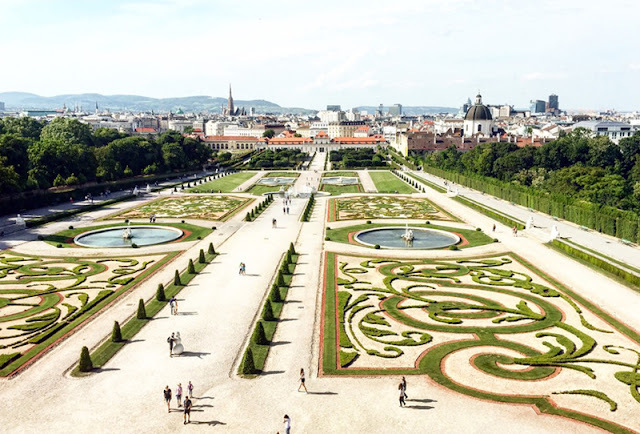 Belvedere Palace: The Belvedere of Vienna is an emblematic part of the history of the country. It consists of two Baroque palaces (Upper Belvedere and Lower Belvedere), The Orangerie, the Stables and the impressive gardens. Volksgarten: A beautiful park around which there are many sights such as the Parliament, the Town Hall and Hofburg. State Opera House: The Vienna State Opera is one of the most famous and old opera houses in the world. While in the early years of its operation it was not quite popular, today it is one of the most famous operas, with over 200 performances a year. Tickets can be purchased online. Albertina: One of the largest and most important Galleries in the world. It hosts among other works of Monet, Picasso, Klimt, Ernst and Miro. Hofburg: Built in the 13th century, it was the home of the leaders of the Habsburg dynasty, and today it is the official residence and workplace of the President of Austria. Inside it functions as a museum with exhibits related to Princess Sissi (clothes, jewelery, porcelain, etc.). 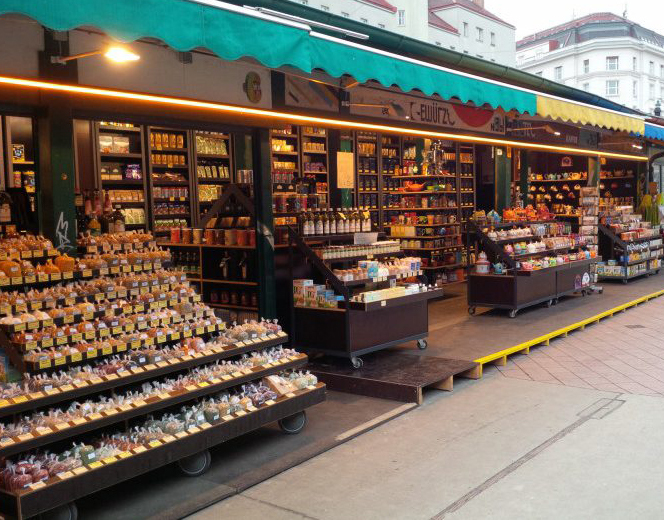 Visit Naschmarkt: A trip to Vienna can’ t considered complete unless you visit Naschmarkt. The oldest and largest market in the city where you can find everything from local products to Asian delicacies. The best day to visit Naschmarkt is Saturday, when there is a large open-air market in the area. 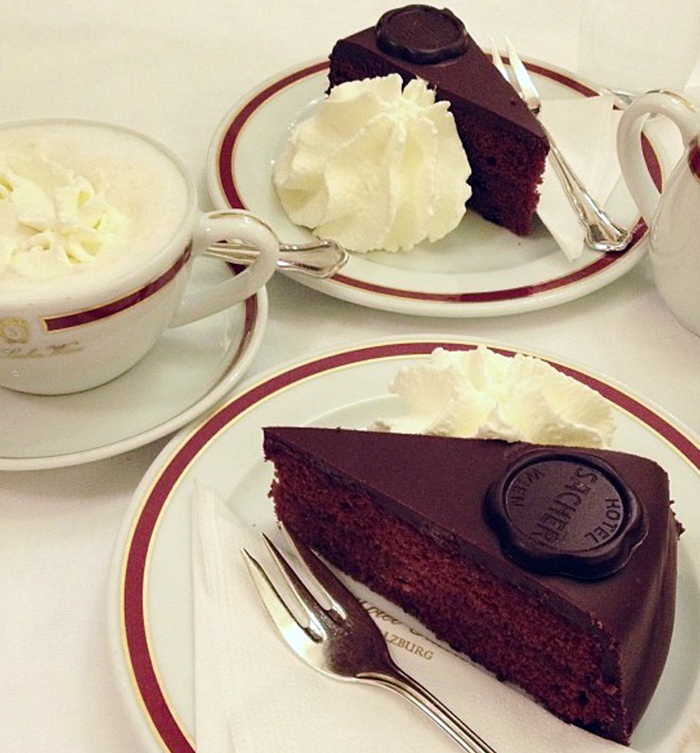 Viennese cafes: Coffee in Vienna is more than an instant enjoyment. Unlike the rest of Europe where people drink their coffee and leave, it's normal in Vienna to sit for hours enjoying your coffee. So take a Mélange (cappuccino) and a cake and watch the Viennese people as if you were one of them. Shopping in Vienna: Mariahilfer Strasse, the most commercial street in the city, is also one of the longest and busiest shopping streets in Europe. Also in Stephansplatz there are the city's two major commercial pedestrian streets, Graben and Kartner Strasse. Even if you do not intend to shop, you can spend a pleasant afternoon. 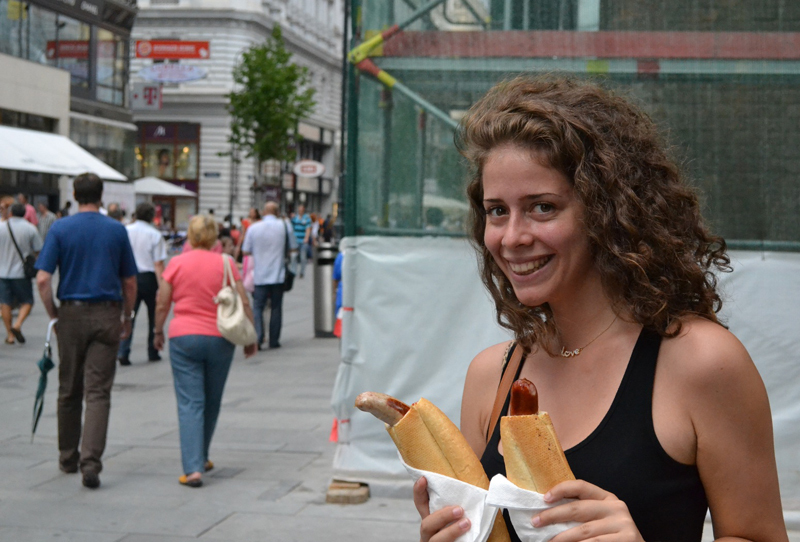 You cannot go to Vienna without tasting Schnitzel but also Eitrige (a cheese sausage), another typical Viennese dish. But also some desserts like Apfelstrudel, Topfenstrudel or some other cake in a Viennese cafe. The most famous dessert, however, is Sacher Torte, a chocolate cake with apricot jam. It's a cake that you either hate or love. I personally love it! For delicious Schnitzel and authentic Austrian cuisine, at Gasthaus Quell, at Figlmüller, with the huge Schnitzel and the perfect potato salad at Amerlingbeisl, especially if the weather is good for enjoying your food in the beautiful courtyard, in Mariahilferbräu, where the waitresses dress up with traditional costumes, but also in the Glacis Beisl with its also beautiful exterior. Regarding where to drink your coffee, Café Central is the most famous cafe in the city. If you prefer something with less tourists, one of my favorites is the Café Sperl and the Palmenhaus greenhouse. If you want to get away from the classic Viennese café, I suggest the Vollpension, which also has great cakes. Just walk and allow yourself to get lost in the city for a while. In Vienna, all sights are within walking distance, meaning you can explore the whole historic city center on foot. But even if you are tired of walking, the city's public transport is one of its best in the world. There are many choices, depending on the money you want to spend. We stayed in the beautiful and modern Stanys Hotel & Apartments, near the train station. If you are more of a hostel type, Wombats City Hostel Vienna is a very good choice.